Born on the Isle of Lewis, Rothshire on 27 October 1841, he entered the services of the Hudson's Bay Company in June 1859. Arriving at York Factory, he worked as an apprentice clerk at York Factory, Lower Fort Garry and Fort Norman before being appointed clerk-in-charge at Fort Liard. He then spent the period from 1873 to 1882 at Fort Qu’Appelle, first as clerk-in-charge and later as junior Chief Trader and finally Chief Trader. He later served at Fort Ellice, Ile-a-la-Crosse and Fort Pitt, at the latter during the time of the 1885 North West Rebellion. There he was taken captive by Big Bear and held captive for 63 days. He related his experiences in a series of articles published posthumously by the Manitoba Historical Society. 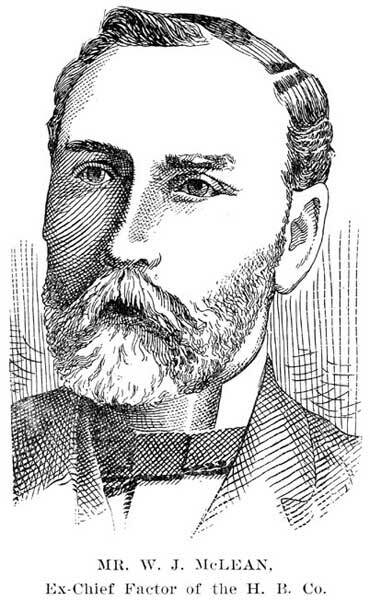 He served as Chief Trader at Fort Alexander and Lower Fort Garry in Manitoba, retiring to Winnipeg in October 1892. He then spent 15 years working for the federal government, paying treaty money and distributing supplies to aboriginal peoples. In 1908 he was a member of a party that walked nearly 2,500 miles distributing treaty benefits. He and wife Helen Hunter Murray (1850-? ), eldest daughter of Alexander Hunter Murray, had twelve children: Amelia McLean (wife of Frederick H. Paget), Elizabeth McLean (1869-1947), Katherine McLean, John McLean, William A. McLean (b 1872), Angus Samuel Archibald McLean (1875-1951), Duncan McLean (b 1877), Helen McLean (b 1881), Owen McLean (b 1883), Freda McLean (b 1885), Hunter Murray McLean (1888-1979), and Mary L. McLean (b 1890). He died at his Winnipeg home, 116 Rose Street, on 12 November 1929 and was buried in St. John’s Cemetery. “Big Bear” M’Lean, pioneer factor, dies”, Manitoba Free Press, 13 November 1929, page 4. Obituary, Manitoba Free Press, 13 November 1929, page 21. Obituary [Hunter Murray McLean], Winnipeg Free Press, 23 January 1979, page 45. Hudson's Bay Company Archives, Biographical Sheets.